As part of our continuing effort to become a living Portlandia skit, Becky and I took a beekeeping class with Round Rock Honey a few weeks ago. After driving through a neighborhood that a real estate agent would euphemistically describe as "up and coming," we reached at a nondescript warehouse - the automated voice in Google Maps assuring us that we had in fact arrived at our destination, all outward indications to the contrary notwithstanding. But once we entered the building, and saw the workshop filled with partially-built hives and the display table covered with various bee products, we knew we'd arrived at the right place. Before we donned our spacesuits and got to actually meet the bees, we were treated to an interesting and informative class about beekeeping, and the honeybee life cycle. And I have to say the life of the honeybee isn't exactly enviable. If you're a worker bee, you can't hope to live much longer than a couple months. The day you emerge from your brood cell, your entire life is dedicated to the health of the colony. This is not a great environment for strong individualists. The center of a honeybee colony is the queen. The queen exists for one purpose: to make more bees. 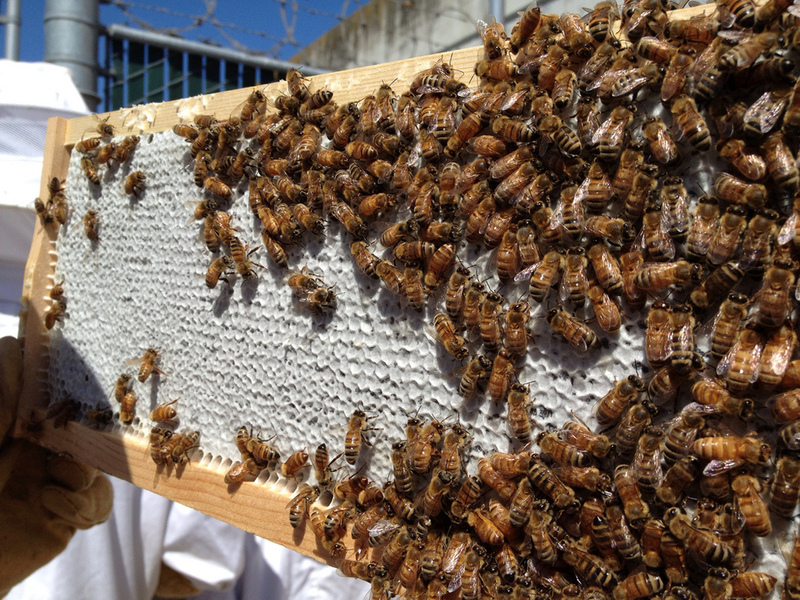 Every worker bee in the colony is the queen's daughter (all the workers are female). The males (called "drones") are kicked out of the hive ASAP, since they do nothing but eat honey. Once they leave, they find another colony and mate with its queen. If the queen starts to lag in her egg-laying duties, the workers have absolutely no compunctions about killing her so a new one can take her place. And if more than one queen is born at the same time, what follows is a war of royal succession that makes the most brutal episode of Game of Thrones look like a fraternity prank. Imagine a version of that show in which every single character is as ruthless and sadistic as Joffrey, and you get the idea. After that dose of nightmare fuel, it was time to suit up and go outside to actually see the bees. I have to say, standing among a cloud of bees while they go about their business was incredibly relaxing - almost meditative. Oh, and we also got to taste honey fresh from the hive. It was amazing. We've taken a few great food-related classes since starting this blog, but this beekeeping class has been my favorite so far. While Becky and I probably won't be keeping bees in our backyard anytime soon (though we plan to eventually), we gained a new respect and appreciation for the dedicated individuals and businesses who keep the craft of small-scale beekeeping alive. 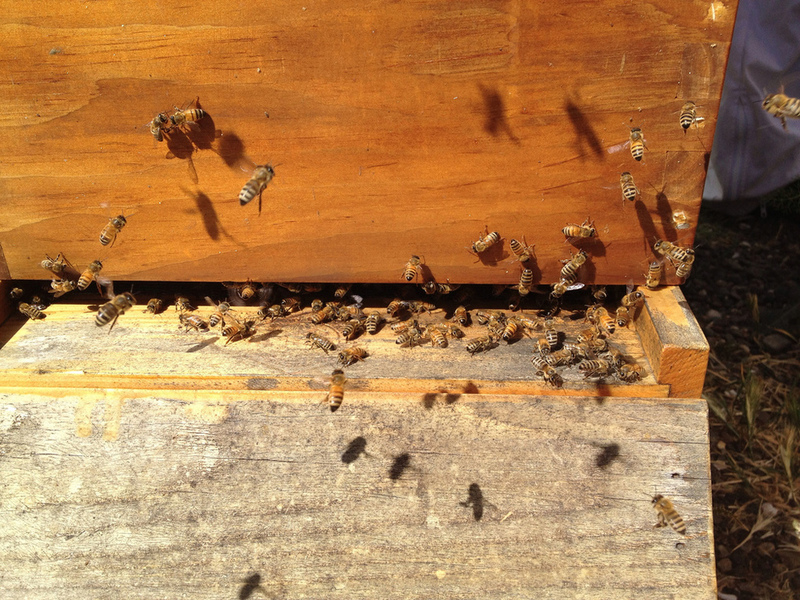 As you might have heard, honeybees are having a rough go of it lately, and we need them a lot more than they need us.